It was not until December of 2004 that this classic river was discovered. Robbie Dastin, Pucon resident and Pioneer of numerous Chilean first descents found the river and did the first D with Russel Kelly and Mateo Wilson. The water source is Cerro Encanto (1890 meters) and other lower peaks forming the border with Argentina. The river is located east of the shores of Lago Ranco and flows into Lago Maihue. To get to the takeout drive to town of Futrono on North side of Lago Ranco then continue east until pavement ends in Llifen. From here it is approximately 22 km to the turn towards town of Chabranco. You will cross over Puente Curringue and this is the takeout. 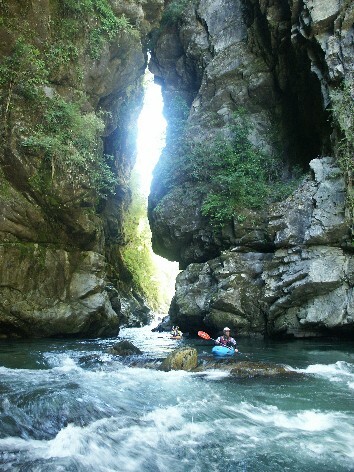 To reach the put in cross the bridge and follow signs to Termas de Chihuio. The drive is roughly 12 KM and offers no views of the river. The termas are marginal but cheap. The Put in is directly accross from the Termas and provides a good campsite as well. 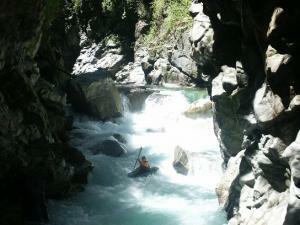 The river is best run in early summer with december usually being optimal. 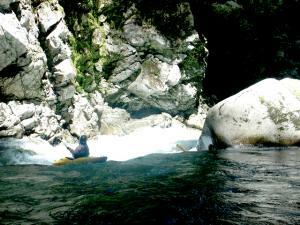 The river is crystal clear with a mature streambed and two distinct tight walled canyons. The drops are class 4-5 and are all runable yet also portagable if water levels make them unsafe.